This section speeds up the process of displaying the required reports in statistics. Here you can create any number of pre-set reports. The following information about created reports is available here: Name and Type. The report type, in this case, corresponds to the tabs in the “Global report” and “Conversion report”: Total, Flows, Campaigns, Traffic sources, Affiliate networks, Offers, Landing pages, Conversions. To create a report, press the “Create report” button in the upper right corner, enter a report name for the convenience of search, select the report type (Total, Flows, Campaigns, Traffic sources, Affiliate networks, Offers, Landing pages, Conversions), mark the checkboxes in the drop-down list to display the corresponding columns in the statistics, and click “Save”. “Edit” – this option lets you edit the pre-set report. “Copy” – copies the pre-set report. “Delete” – deletes the pre-set report immediately. “Export” – exports the list of reports and their type in CSV. “Refresh” – refreshes the manage report section. 1) Filtering by values in columns. To do that, click on the filter icon near the column name, select value and click on “Apply”. If there are too many values in the column, the system will not upload the list automatically. Though, you can find the needed values the same way: enter value and press “Enter”. After that, you will see the checkbox with values. Tick it and press “Apply”. Note that you can filter out data by several columns at a time. 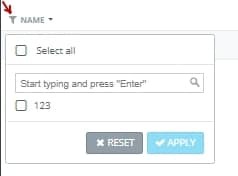 To cancel filtering, you need to click on the filter icon and press “Reset”. 2) If to click on the arrow icon to the right of the column name, the list will be listed alphabetically (A-Z, Z-A), or by quantity (from high to low and vice versa). To apply the report, you should select it in the side menu of the “Customize table” in the “Global report” and “Conversion report” sections.